On the Eve is the portrait of a world on the brink of annihilation. 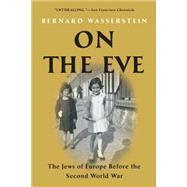 In this provocative book, Bernard Wasserstein presents a new and disturbing interpretation of the collapse of European Jewish civilization even before the Nazi onslaught. Based on comprehensive research, rendered with compassion and empathy, and brought alive by vibrant stories, On the Eve offers a vivid and mind-opening picture of the European Jews as the continent spiraled toward the Second World War.